Here's a brief introduction to the citizens who have recently moved in. Shiro is a 9 week old male from a breeder in New Gloucester, Maine who also has dogs with Rosasharn bloodlines. Shiro's grandmother is also Bundle's grandmother. Bundle's father is Shiro's grandfather. Although Bundle and Shiro have know each other less than a week, they're already best friends. Bundle is teaching Shiro how to guard effectively. They have boundless energy. 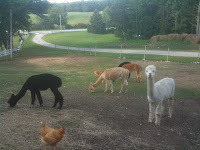 Our 8 alpacas are from Bittersweet Cove Farm in Maine. At Unity, they are separated into two paddocks - 3 males and 5 females. Our males are Stanley (1 year old), Midas (3 years old) and Domino (3 years old). They're very good natured and Stanley likes to rub noses with his humans. Our females are Ella Mae (5 years old), Tinkerbell (4 years old), Persia (2 years old), Daisy Mae (1 year old), and Mocha (7 years old). They have very fine fiber and spend their days enjoying hay and fresh growing orchard grass in the warmth of summer. Our llama is Black Orchid from Fort Lucas farm in Colrain, MA. She guards the female alpaca vigilantly. She's pregnant and today she'll have her first pre-natal visit from a traveling vet. We have 12 hens and 1 rooster. Each is named according to their color and personality - we have i.e. Rainbow, Terra, Clover, Silver, Chipmunk, Midnight. Our rooster is named Lucky since we received him as a gift from a farm that prepares roosters for Sunday dinner. Our hens will begin laying very soon. Our 22 guinea fowl roost in the coop at night but spend their days wandering our property, eating ticks and other high protein foods they find in the forest. They ground flock - moving together a single large group. We have 9 blacks, 11 silvers, and 2 whites. One of the guineas is not able to walk due to a birth defect, but he's a fighter and has learned how to hop along with the flock. Every night one of the large guineas flies down from the rafters of the coop to keep him company. Our rabbits are 10 years old and share the coop with the chickens. The male is Jack and the female is Annie. They enjoy the scraps of fresh vegetables we bring to the flock - broccoli stems from the garden, corn cobs, and lettuce. Our cats are also 10 years old. Tigger enjoys sleeping in the sun, while his sister, Lily spends her time exploring the house and looking for small creatures to chase. Since moving to the farm at the end of April, we've had to build the infrastructure and support systems to keep our barnyard citizens healthy and happy. Picking the right hay, controlling flies, and managing manure are all skills we did not have a few months ago. In upcoming Thursday posts, I'll share all our lessons learned on topics that may be unfamiliar territory for my usual readers! you are the coolest CIO ever.